Prepare streusel topping and set aside. In a small bowl, whisk together flour, baking powder and salt and set aside. In a large bowl, beat butter and sugar until light and fluffy. Add eggs, vanilla and milk. Add flour mixture and stir until just combined. Divide batter evenly into 12 muffin cups. 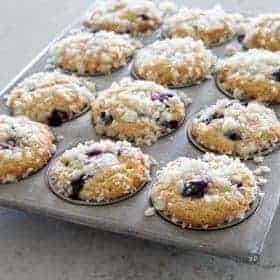 Sprinkle muffins with streusel topping. When muffins are done, cool for a few minutes in the muffin pan before removing to cool on a wire rack. In a small bowl, whisk together sugar and flour. Add oil and mix until mixture has a sandy texture.